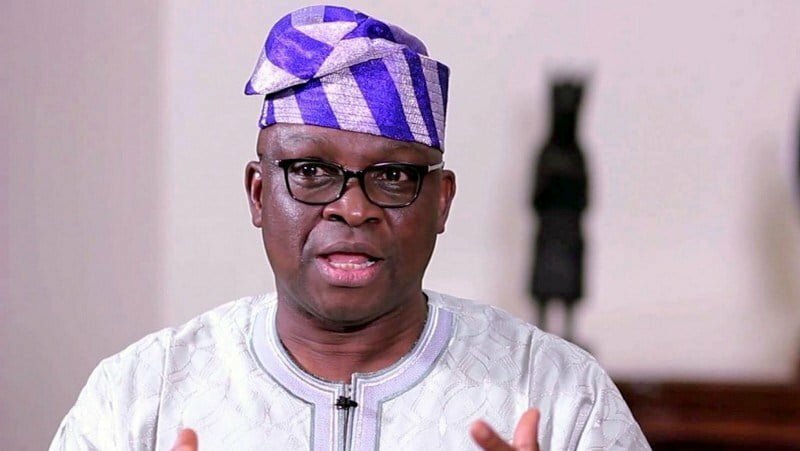 The Governor of Ekiti State, Mr. Ayodele Fayose, on Monday told the former Minister of Works, Prince Dayo Adeyeye that he is free to decamp to the All Progressives Congress (APC) if he was displeased with the adoption of Deputy Governor Kolapo Olusola as his successor. Fayose insisted that the APC-led government under President Muhammadu Buhari is sick and failing the people. “When Boko Haram takes over the space, when herdsmen are killing the people and when economy is completely down, then the leaders have failed the people”, he said. Adeyeye, who hails from Ise Ekiti in Ekiti South senatorial district, formally declared for the plum seat in Ado Ekiti last week Wednesday. The former Minister, as well as the Senator representing Ekiti South in the Senate, Mrs Biodun Olujimi, former Nigeria’s envoy to Canada, Amb Dare Bejide and immediate past Commissioner for Justice and known Fayose’s protégé, Barr. Owoseeni Ajayi, had jointly condemned the adoption of Olusola as the PDP sole candidate. They described the action taken by a section of the party as too pedestrian and antithetical to democratic norms. Fayose, who spoke at the rally held at Okesa area of Ado Ekiti, said he was not in any way rattled by the negative utterances being hurled gainst him by anti-Olusola aspirants. He said: “The PDP has taken a position, I say we have taken a position and we have no apologies for that and the position was that Olusola should take over after me as the governor of Ekiti. “It doesn’t matter to us how many people that are abusing us by our action. They are even free to join our adversaries, but we will defeat them as the God liveth. “This is just a baby declaration, the date of the declaration will be announced later. By the grace of God, Olusola will be governor of Ekiti. instructed me to pick him. I said we will go together after our tenure, but God said I should allow him to stay that what I said was my own opinion. “This is a show of strength to tell them, I mean the APC that we are here. We have what it takes to win election. “They said they want to rig election, that will not happen here in Ekiti, they should look elsewhere. Thy must know that politics is not played in the other room but in the living room. “This government started with nothing, but we have achieced a lot. We have improved the infrastructural development. We built the flyover, the Oja Oba market, the new governor’s office. “I came, I saw and we conquered. If you want to rig, not in Ekiti, look elsewhere because I am a streetwise boy. We are good at the game. I am not someone you can trick and score in my net. “They want to cause disaffection in PDP. You will wait in vain. Whether you like it or not, Olusola will become the governor. This struggle is to prevent Ekiti from going into slavery”. Fayose said contrary to the position fondly canvassed by ex-governor Kayode Fayemi that his government has borrowed a staggering sum of N56 billion, he has not borrowed a dime since he ascended the seat. “Let them know that election is not won by propaganda. If they are sure of what they were saying, let them tell us the bank that gave the loan, the papers leading to the transactions. “They were given the opportunity by the good people of this state, but they failed the people. Whether they like it or not, come July 14, Olusola will be governor”, he said.